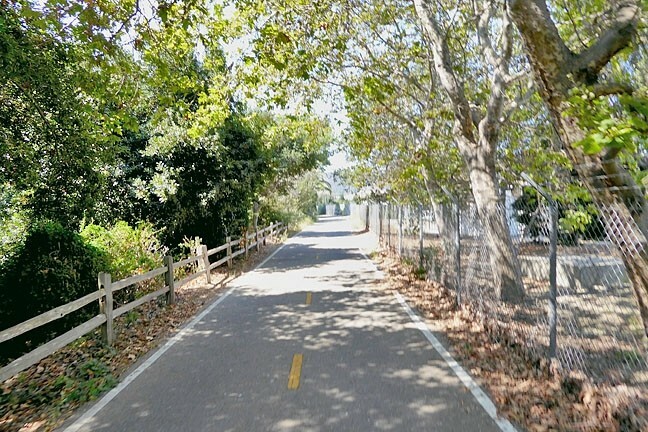 Instead of the typical summer gray-shrouded morning, my wife—Anna—and I awake to clear skies on Sunday, Aug. 28, and decide to ride the newest section of the Bob Jones Trail between Prado Road and the new Los Osos Valley Road overpass. TREES GALORE : Much of the ride features thick layers of oak, walnut, and conifer trees. Watch out for walnuts all over the path! First, of course, we need some fuel, so we peddle from our Laguna Lake neighborhood through downtown, taking a right turn on the Bill Roalman Bike Boulevard that travels up Morro Street toward the train station. It’s a great bike amenity with only one stop sign between Marsh and Upham Street, allowing bikes a safer and virtually unimpeded path from downtown to the Rail Trail, which goes over the Jennifer Street Bridge and travels along the train tracks to Sinsheimer Park. Our destination is Bon Temps Creole Cafe. Anna tucks in some Eggs Sardou—two artichoke bottoms filled with poached eggs and Hollandaise on a bed of Cajun creamed spinach—grits, and a biscuit. I go for the Fat Tuesday Omelet, stuffed with tender beef and smoky bacon in a Marchand du Vin sauce, with melted cheese; Cajun hash browns, and a biscuit. Throw in a couple mimosas and we’re ready to ride. 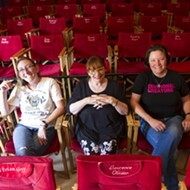 ENTER HERE! 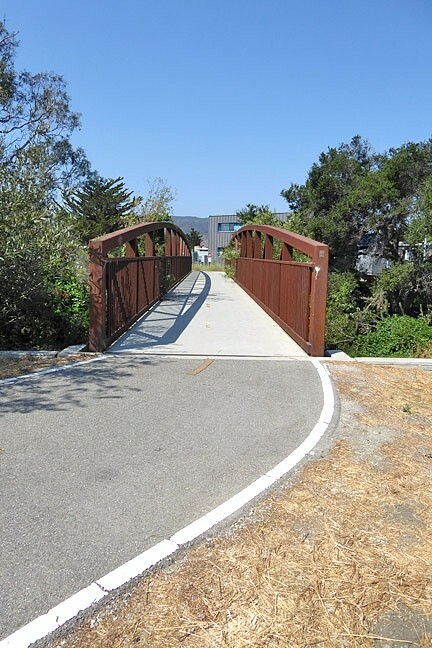 : This pedestrian and bike bridge on the corner of Prado Road leads to the newest segment of the Bob Jones Trail that will eventually connect to Avila Beach. “Oh my God, I’m so stuffed,” I say, swinging my leg over my bike. We both love Bon Temps, so it’s a satisfying fullness, and we head down Santa Barbara to South Street, taking a left on South Higuera Street until we reach the Prado Road intersection. On the corner near the pedestrian bridge that leads to the Bob Jones Trail, we pass the Native American statue of a shirtless, loin-clothed Plains Indian. The 12-foot bronze by sculptor Nell Banister Scruggs is called Oh Great Spirit. It’s cool and all, but other than being a depiction of a fellow Native American, it bears little to no resemblance to the Chumash people who actually populated our area. Still, public art is always a welcome bonus to a bike ride. 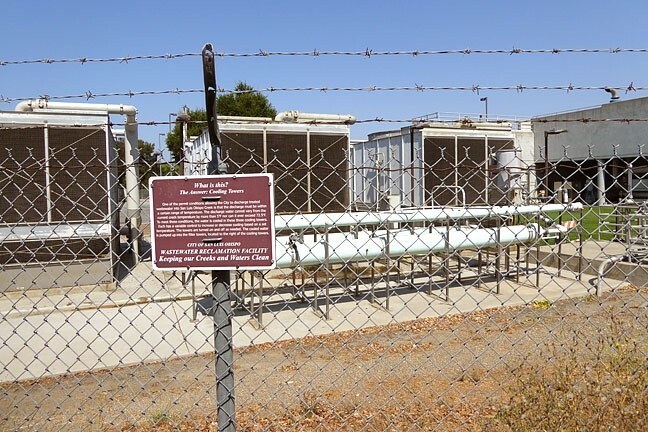 INFRASTRUCTURE: On one side of the ride, you can get an up close and personal look at city water treatment infrastructure along with signs explaining what you’re seeing. We head down the asphalt pedestrian and bike path, on one side lined by conifers, oaks, and walnut trees, the nuts of the latter littering areas of the path. The other side is filled with infrastructure related to the sewage treatment plant. 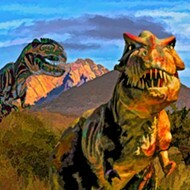 Both are interesting in their own way, one a bit smellier than the other. On the chain-link fence infrastructure side, signs explain what you’re seeing: “What is this? The Answer: Cooling Towers,” followed by a detailed explanation of their purpose. THE MORE YOU KNOW: This kiosk near the LOVR overpass explains the history of the Bob Jones Trail, the health of the nearby creek, and what to do if you encounter a mountain lion. Oh my! It’s an easy ride, mostly flat, a few curves to keep it interesting. 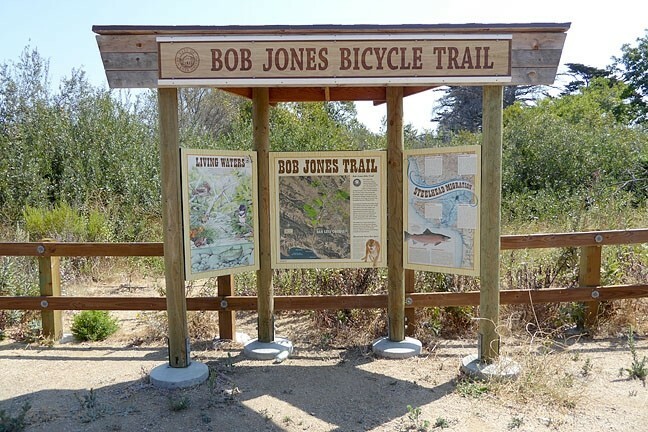 When we reach the end near the LOVR overpass, we stop at a kiosk that explains who Bob Jones was and the ultimate plan to connect the SLO Town portion of the trail to the Avila Beach portion. In 2015, the SLO County Board of Supervisors unanimously voted to approve the projected $10 million completion of the new 4.5-mile trail from the Octagon Barn to the existing trailhead on Ontario Road. Anna and I can’t wait, but we’re definitely going to need more Cajun food.